Meet Dr. Pat Bona, aka “Dr. Pat” – A chiropractor to humans, inventor of the Posture Prep® and Wellness Prep™, and a consultant for the Posture Prep Cross Fiber grooming technique for horses and small animals. Restoring good posture and well-being. Her goal is to help humans and animals maintain strong biomechanics to function effectively for a healthier life. Dr. Pat developed a love and passion for horses as a youth in 4-H. It was there that she learned to judge conformation and movement in horses but also paid attention to how people walked and carried themselves. This led to her interest in chiropractic as a career. She received her post-graduate Doctor of Chiropractic in 1987 and has been a member of Broad Axe Chiropractic Center since graduation. But she never lost interest in equine biomechanics, which led her to earn her certification from the American Veterinary Chiropractic Association in 1994. She understands the strong bond that people have with their animals and her approach is to have both humans and animals optimize their health for more rewarding interactions in work and play. Dr. Pat has a diverse practice ranging from patients with more sedentary lifestyles to amateur and competitive athletes. While some of her patients are seeking relief from soft tissue issues such as plantar fasciitis or even chronic conditions such as fibromyalgia, many more are trying to find ways to manage old injuries that have led to adhesions and scar tissue. She provides a customized treatment for each patient so they can maximize their ability to thrive and feel their best while living their life. Dr. Pat’s practice focuses on her Posture Prep Cross Fiber grooming technique with horses. As a lifelong equestrian, Dr. Pat has ridden a variety of disciplines including dressage, sidesaddle, and eventing. She enjoys the horse-human relationship as it is filled with the challenging dynamics involved in effectively working together. Riders often don’t realize the effect of gravity as an unyielding force to affect their posture and movement as well as that of their horse. Dr. Pat works with riders to teach techniques to improve their own posture and that of their horse, as this is the foundation for optimum biomechanics, performance, and overall well-being. 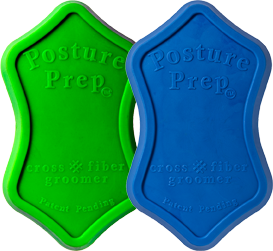 The Posture Prep Cross Fiber grooming technique also works well with dogs and other small animals, including cats, and offers them the comfort and relief of a mini-massage to keep them playful and active. These tools are her trademarked products assisting in myofascial release to help improve posture and athletic performance while also helping to decrease the incidence of injury. Dr. Pat provides detailed how-to instructions and videos on her patented tools to help people understand the use of the products for themselves and their animals, leading to healthier and happier interactions. Inventing the tools was a revolution… and an evolution. Dr. Pat developed the original Posture Prep tool for horses so she could offer an improved tool to optimize her Cross Fiber grooming technique. While she was developing the original prototype for the horse tool, her mother, Mildred Bona, became curious and decided to use it to massage her own scalp. Through simple modifications, Dr. Pat designed the Wellness Prep™ tool for humans so they could also enjoy the benefits of myofascial massage and release. The success of the Posture Prep groomer for horses led to a smaller version for dogs and other pets. Dr. Pat sees her life as blessed. Her passion is to enable and inspire others to live healthier and happier lives and her work gives her the chance to be a healer, molding the living medium of the humans and animals in her practice. She also works as an entrepreneur, creating and marketing her patented tools, further empowering her patients to manage their own wellness. Dr. Pat Bona lives and practices in Blue Bell, PA where she is active in maintaining her own functional fitness complemented by horseback riding, ballroom dancing, and a passion for Argentine Tango.